I didn’t get to do a Lenten series this year because a lot of things went completely out of my control. Schoolwork and research totally consumed my life, and I barely had time to sit down and decompress before I had to move onto something else. It seemed like my world was crashing down around me, and on top of all of the academic pressures, there was the pressure not to get sick, and to turn in certain applications on time, not to mention find funding for an upcoming trip to Europe and just general trying to figure life out stuff. But I overheard something a few weeks ago that I didn’t get around to blogging until today. I can’t remember where I heard it, or even who said it, but I remember that this person was talking about their home church. This person said that their pastor had said that Lent isn’t a season of giving up or taking on something, but rather it was a period of reflection. We must take these 40 days and do some deep soul-searching. We must pause, even if only for 10 minutes out of our day, and think about the gravity of what is to come. Currently, it is finals week at Wartburg College. There are so many tests that need to be taken and papers and projects that need to be completed, that we forget it is also Holy Week. Tomorrow is Maunday Thursday, the day after is Good Friday, and Sunday is Easter. What have I done for Lent? I gave up my personal Twitter account, and made an effort to not be so much of a jerk. The former has been going strong, but the latter has faltered, mostly because it’s hard to change one’s personality in a day. But while I made a conscious effort to better myself, I also failed to take the time to sit down and let myself just be in the presence of the world. During this Holy Week, with everything that is going on that needs your immediate attention, don’t forget to find a quiet place, even for 10-15 minutes, and just let your mind wander. Clear your mind, and reflect on what the world has given you. You don’t need to be looking for any epiphanies, nor do you need to be mediating on a certain word for phrase. Just let life happen for a little bit. It’s amazing what you can find when you silence those reminders and looming deadlines. On Saturday, I had to attend the funeral of a seven-year-old. His name was Luke Hansen, and I met him this summer when he was one of my campers for Vacation Bible School in Hurley, South Dakota. At the time I met him in mid-July, he was already four months into cancer treatment. In March, he was diagnosed with an inoperable brain stem tumor. Immediately, he began treatment: radiation, steroids, physical therapy, the works. For us adults, going through all of this would be rough. And at times, Luke hated what he had to go through to get better. Yet if I hadn’t been told that there was something wrong with Luke, I never would have guessed. He sang the loudest, ran with the bigger kids, talked all the time, and was just your average seven-year-old, except with leg braces and limited mobility on one side. He was the coolest little kid, so full of life and energy. When he showed up to VBS on the last day with “Team Luke” bracelets for the staff, I was touched, and gladly accepted membership to the Team. From that moment on, Luke became my Superhero. 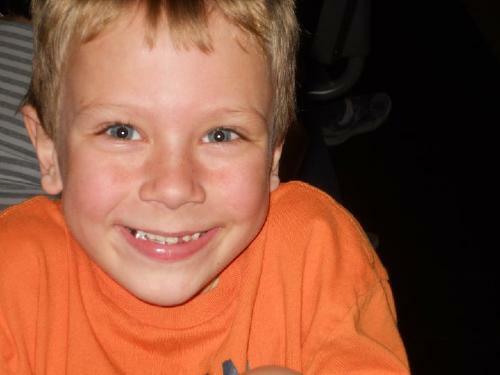 I subscribed to the Caring Bridge website, keeping tabs on everything going on with Luke. I cheered him on when I heard that he was able to play in a couple of baseball games, I wished him luck when he started second grade, and I became concerned when he wasn’t able to go to school because he was too weak. Being so invested in Luke, I knew I was setting myself up for disappointment. Luke was able to do anything, and even though I was hoping he would be able to beat his disease, I knew every time I looked at my Hulk-green “Team Luke” bracelets that soon he wasn’t going to be around. That day came the morning of Wednesday, 24 November. I got the email update that Luke had passed away. I’m glad I got it after I had arrived at home for Thanksgiving break, first because it meant that I could be in Hurley for the funeral, but also because I knew if I had gotten the news while driving, I would have had to pull over. Luke’s funeral on Saturday was wonderful. Over 100 people showed up to send him off, offering so many memories that the basket was overflowing. The doors to the public school had the Incredible Hulk greeting everyone as they entered, and autographs and well-wishes from his sports heroes filled two tables. Luke looked as handsome as ever in his white casket, decked out in his favorite Twins jersey (no surprise there). Many wonderful memories were shared, including a touching poem by Luke’s older sister, Jasmyn. As I sat back and let the tears roll, the topic of lessons came up. Someone mentioned that Luke taught her some important lessons, including to always be a cheerleader, and to learn the value of numbers. Important lessons as they are, Luke taught me an especially important one: live with no excuses. For eight months, Luke had death looming over him. And yet, somehow, it didn’t faze him at all. He ran, he jumped, he climbed, he loved, he sang, he lived. And here I am, almost 21 years old, still making excuses for why I can’t do things: I’m not talented enough, it’s too far out of my comfort zone, I’m too old to do that, I’m too invested in what I’m doing to completely rid myself of it. But Luke showed me that there can be no excuses in life. Life is way too short to focus on what you can’t do. Instead, focus on what you wish you could do, and do it. If it works, you have a new skill. If it doesn’t, then put it behind you and try something new. Luke was, and always will be, my biggest Superhero, and I hope that someday, I can be like him when I grow up. Last month, I got a chance to spend Easter Sunday with my girlfriend, who is a Presbyterian. Growing up a good Lutheran boy, I’ve never experienced Easter outside of the Lutheran tradition. It was an amazing celebration with a different denomination, and I experienced a new way of taking Communion, along with some amazing hospitality and some good talks with her church family. During the six hour drive back, we had a great talk about our faith and church experiences. I mentioned that I thoroughly enjoyed the hospitality and friendliness of her church, because in my experiences with different Lutheran churches, Lutherans are pretty stuffy, and tend to look down on strange people that enter the church. I mentioned that, while I don’t really think I could leave my Lutheran upbringing, I would definitely attend a church that was even half as friendly and inviting as her church. This then led to a doctrine discussion, and she mentioned that she loved every part of the Presbyterian doctrine, except for one thing: the belief in Predestination. Predestination is the belief that God, in his omnipotent power and infinite wisdom, created the entire Universe in all of time, meaning that every person’s life and every world event was created and determined ahead of time. With this belief, there is no free will, because whatever you’re going to do has already been planned. On the other side of this coin is the notion of Free Will, which says that there is no interference from a Higher Power, and that we control our actions and our destinies. Our actions control our fates, and it is completely our own faults if we end up in riches or in poverty. I’ve never really been sold on the idea of Predestination. I’m uncomfortable with the idea that my actions are not completely my own. If it’s already been decided ahead of time what I’m going to do with my life, my thinking is, why bother live it? It’s not really the “big picture” I’m opposed to, it is every little nuance in my life that has been planned out that I’m opposed to. I’m uncomfortable with the idea that every little thing I do is planned out: every time I blink, every time I eat, every time I pick my nose, it’s all been decided for me. I need a little wiggle room in my existence. It can’t all be so meticulously structured. Then again, I’m not completely sold on Free Will. It is the other extreme in the spectrum. Where Predestination is God’s complete control over existence, Free Will is the complete removal of God from the equation. I like the idea of absolutely no structure about as much as I like the idea of complete structure. The idea that my life is completely under my control is frightening, because in the 20 years I’ve been alive, I’ve made some pretty stupid decisions. If my life were under my control, I’ll surely drive myself into the ground. I need some sort of guidance and structure, but not the complete structure of Predestination. I believe that there is a middle ground between Free Will and Predestination, a sort of “outline” with which we run our lives. It is a blend of Free Will and Predestination: God created our lives, and God wants us to achieve a number of major life events, but it is up to us to get there. I like knowing that I need to do certain things in my life, but I also like the idea that it is up to me to achieve those things. This belief also helps me come to terms with all of the death in the world. People who die young, even if it looks like they had so much to live for, have completed everything they needed to do in life. Meanwhile, people who seem like they’re never going to die are obviously missing something, and will continue to live until they achieve that goal. This shouldn’t be confused with stuff you want to do. That is different. If it were up to us, none of us would die, because we would always have something new that we want to do, and cannot die until we do it. Instead, it is what God has planned for us, the people we are to meet and affect, the charitable things we are to do, and so on. I believe we write our own stories, and like any good story or academic paper, it is the outline that must come first. I’ve been staying at a friend’s house for the past couple of days in an effort to get out of the house while on break and exploring Minneapolis, Minnesota, a city I’ve been to many times but have never really gone out and explored. In my time in Minneapolis I’ve attended a concert put on by the Minnesota Orchestra, gotten lost in the city numerous times, and tonight will be at the Mall of America, enjoying myself at a Patrice O’Neal show at the House of Comedy. But despite everything that’s happened while I was in Minneapolis, the one thing that I just realized–that I hope everyone will realize soon–is that people are just like rolls of toilet paper. Let me explain: while I was using the facilities in the house I’m staying in, I noticed that the toilet paper roll was empty. Being a kind guest I found a new roll, and replaced it. But before I put the roll back on, I paused, and the great debate played through my head: is this household a “roll-over” household, or a “roll-under” household? It honestly stopped me for a moment. I didn’t want to put it the wrong way, or else I would be inconveniencing people in the house, as they reach for the toilet paper and go, “Dang it, it’s rolled the wrong way.” I had a short panicky moment, before I decided to look at the empty roll and see which way they preferred it. But looking at the roll, I noticed that it was completely empty, and that there was no way I would be able to tell how they preferred it. It was then, oddly enough, that I had a moment of clarity that I felt compelled to tell the world: we are just like that roll of toilet paper. Our different ways of rolling are our different beliefs and convictions: Christians “roll-under” and Muslims “roll-over”; Republicans “roll-over” and Democrats “roll-under”. The appearance is different, and just like in those toilet paper commercials, sometimes it can get pretty crazy. Some people are just so into their preference of over versus under that it can unwittingly cause shouting matches. Many websites are devoted to solving the Great Debate, and no one will ever get it solved. Looking at that empty toilet paper roll, though, helped me to realize that it doesn’t matter how we hang, because in the end we’re going to be an empty tube, and no one is going to care whether we were an “over tube” or an “under tube” but rather that we got the job we needed to do, done. It no longer matters how we roll, but that we rolled. The charge to the world is to get beyond matters of rolling one way or the other. We’re all on this planet together, and the sooner we can get past petty problems like race, religion, political identification, or sexual orientation, the better we can make the world.